Teachers know that they must diversify their instruction if they want to reach all their students. In many classrooms there are divergent learners. Special education students, learning disabled and many levels of ELLs (English language learners or ESL students). How can teachers effectively teach the subjects to all of them at the same time? The authors of the Include Me ! © Series are painfully aware of this problem,being classroom teachers and resource teachers for many years. The series is pictures based for better understanding of the concepts taught through regular social studies textbooks. The activities are designed to both convey the core subject to all levels of learners and to develop language at the same time. The Include Me ! 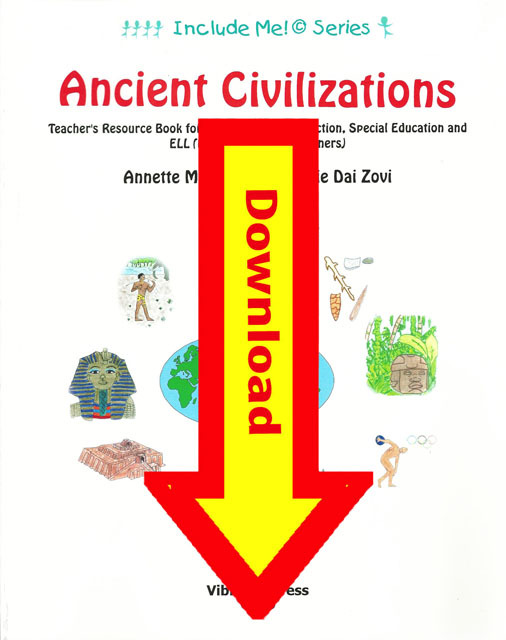 © SeriesAncient Civilizations contain nine units reinforced with the main vocabulary in pictures (in crisp black and white for easy reproduction for the many suggested activities), puzzles in three levels, recall readings in three levels and three levels of language development exercises. Also included are flashcards for all the over 150 pictures and bingo cards.